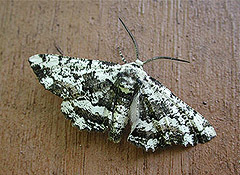 This is the 3rd "Beauty" now added to the site (Tulip Tree Beauty, Pale Beauty), and they are all geometridae (inchworms). 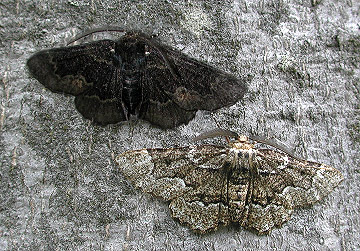 I often come across melanistic (dark form) Oak Beauties in my yard and have shown one next to a more typically colored individual. While, as mentioned, they are geometers, their bodies are stout, more in keeping with your average noctuid. The above head-on photo shows the banded legs that are present in all forms. I couldn't help but notice how the melanistic individual's face looks like one of those long-eared bats. Here's another variation that showed up on June 7, 2005. Still retains those white-ringed legs.